The Catalan novel Blanquerna, described as “the first novel to be written in any Romance language” is less a novel than an extended work of religious instruction in narrative form. Written in 1283 by the Majorcan mystic, heretic, and martyr Ramon Lull - a neglected figure in the western mystical tradition - the work is severe, with an almost morbid religiosity and an emphasis on extreme piety and deprivation, rejection of the world and absolute submission to the (supposed) will of God. Blanquerna is the eponymous hero of the tale, the son of the fanatically devoted Evast and Aloma, a noble couple who have forsaken all worldly goods to live in poverty. They attempt to arrange a marriage for their son, so that as a husband and householder he may manage their wealth in service to God while they retreat into a live of austere deprivation. To the consternation of her mother, Natana, the woman they have chosen for their son, decides after a few minutes interview with Blanquerna to retreat to a convent for the remainder of her life. The following section of the book is an extended description of the mortifications she introduces into the convent. Meanwhile, Blanquerna sojourns into the forest to live as a hermit. He encounters a castle occupied by the personifications of the Ten Commandments, wailing bitterly over the fact that they have been forgotten in this wicked, wicked world. All our hero really wants to do is squirrel himself away in the woods to live a life of quiet deprivation. The problem is that the woods are chock full of knights, shepherds, merchants, and others to whom he can’t resist giving a detailed assessment of the wickedness of their ways. In no time, this killjoy has gained a reputation as a wise exemplar of godly living. (Be warned, the “action” in this story is thinly sandwiched between extended dissertations on various holy topics). Because of his wise counsel and pious example, Blanquerna (as always, against his will) is called upon to live in a monastery, where he becomes first sacristan (whatever that is), then abbott. He eventually rises to the bishopric, and is ultimately elevated to the papacy. Introduced into the story is a wise fool, Ramon, who assists the pope by citing the example of various pious works of reason and devotion (works which happen to be identical to those written by one Ramon Lull). 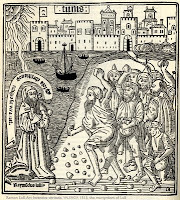 As Pope, Blanquerna oversees the realization of one of Lull’s own pet projects, the establishment of linguistic academies in order to facilitate the conversion of foreign and ungodly souls, particularly the Saracens (Lull himself achieved martyrdom after being stoned by an angry mob in North Africa, presumably following one of his habitual anti-Islamic rants - see illustration). In the end, Blanquerna renounces the papacy in favor of the life of a simple hermit, the role he has fervently coveted throughout all his peregrinations. Much of Blanquerna is taken up with crashingly dull expositions of the religious life, with a few anti-semitic talking points thrown in for good measure. Incorporated into the end of the narrative are two short works of mystical devotion, “The Book of the Lover and the Beloved” and “The Art of Contemplation”. Coming at the end of a rather tedious read, the former is a particularly refreshing, rich, and surprisingly vibrant work of mysticism, inspired by Sufi devotional books and in the tradition of the Song of Solomon and the works of San Juan de la Cruz. This edition, published by Dedalus Books under the guidance of the medievalist Robert Irwin, is a reprint of a ca. 1920’s translation by Edgar Allison Peers.